What is the Abrahamic Covenant? What does it have to do with Christians today? Most certainly, Abraham personified the statement that “the just shall live by faith,” as he was the prototype of living by faith however God still expected “Abraham to be obedient before blessing him.” How was this fulfilled in the New Testament and what does it have to do with believers today? Who were those who were blessed by this and those who were cursed by this statement of God that He would bless those who bless Abraham and would curse those who cursed him? The Bible shows us that obedience comes before understanding and that blessing comes only after obedience which is what Abraham showed when he left family, country, and his father’s house. Thousands of years later, Abraham remains a supreme example of faith and why he was so very blessed by God. I hope to show that Paul successfully linked Abraham with the present in writing to the Galatians in 3:7-8 that the blessings of Abraham is not for “those who claimed to be his children” but for those who trust in the Promised Seed of his which is Jesus Christ and why it is all about grace and not about race. Paul clearly revealed that the boundary markers that inevitably provoke divisions between the Jews and the Gentiles is broken down in Christ and that is the blessing spoken of by God because we who were once afar off from God can now be reconciled to God through Christ. Romans 5:10 and Ephesians 2:13 say the same thing, that we were once the enemies of God…alienated from him by our sin and not by our race, but now through this promised seed, “we are reconciled [and] shall we be saved by his life” (Rom 5:8, 10b). This is the blessing spoken of by God to Abraham because after the fall in Eden, mankind was separated from God by sin as Isaiah 59:2 said, “your iniquities have separated you from your God; your sins have hidden his face from you, so that he will not hear” however “Christ redeemed us from the curse of the law by becoming a curse for us—for it is written, “Cursed is everyone who is hanged on a tree” (Gal 3:13). The blessings come for all nations and all people who put their trust in this Promised Seed and those who reject Him are still under the curse. This is what Paul meant when he wrote that “the Scripture, foreseeing that God would justify the Gentiles by faith, preached the gospel beforehand to Abraham, saying, “In you shall all the nations be blessed” (Gal 3:8). Notice that the gospel was preached even in the Old Testament and in the Scriptures (the Pentateuch precisely) is written the promise given by God to Abraham. Paul even quotes Genesis 12:3 in writing Galatians 3:8, therefore there can be no mistake that the gospel is the message or good news of this blessing and this blessing is the Promised Seed. That is how the nations or all people who trust in Christ will be blessed. It is more than land, it is more than wealth, it is more than children…it is eternal life in the Lord Jesus Christ for those who trust in Him. 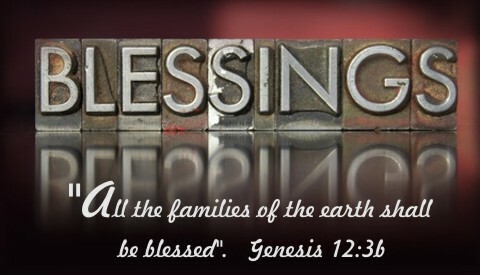 In Genesis 12:3 God tells Abram that in him “all the families of the earth shall be blessed” (Gen 12:3b). To look at Abraham’s being the father of many nations, this blessing would be considered to be a blessing only for a person’s life and that person being in one of the nations that Abraham is the father of. In the context of this verse and knowing that this blessing of his would necessarily result in all the families of the earth being blessed means that there is something more than a physical blessing. Indeed, it is a spiritual one that all the families of the earth would be blessed by the coming sacrifice of the Promised Seed. That blessing is for all eternity for those who repent and trust in the Promised Seed. For them, there is no greater blessing possible. The JPS Tanakh which is a Jewish edition of the Scriptures render Genesis 12:3b as “by you all the families of the earth shall bless themselves” however this does not fit the context of the chapter. When you look at Jacob’s blessing his sons, including adopting Joseph’s sons, as well as Abraham blessing Isaac, and Isaac blessing Jacob, then the wording the “families of the earth shall bless themselves” may make better sense. When attaching the first part of this phrase though, “by you all families of the earth” we would be left with “all the families of the earth shall be blessed by your descendants blessing themselves” which would not make sense. Even the priests had the duty of blessing the Israelites (Lev 9:22-23) so at first, it would seem unfitting to the context because the blessing comes from God and the greatest blessing is spoken of as the singular pronoun, the Promised Seed, and this seems to be about what Peter said in Acts 3:25 where he spoke of “Abraham, And in your offspring shall all the families of the earth be blessed” and which is also supported by Paul’s clear testimony in Galatians 3:16. God was speaking about the blessing not being many but by the One, that is Christ. In the New Testament, Paul writes that the “God and Father of our Lord Jesus Christ [has] blessed us in Christ with every spiritual blessing in the heavenly places” because “he chose us in him before the foundation of the world, that we should be holy and blameless before him” and has “predestined us for adoption as sons through Jesus Christ, according to the purpose of his will” (Eph 1:3b-5). Paul was clear that “the promise to Abraham and his offspring that he would be heir of the world did not come through the law but through the righteousness of faith” (Rom 4:13). Who is this offspring exactly? There is no doubt that Paul knew that “the promises were made to Abraham and to his offspring. It does not say, “And to offsprings” referring to many, but referring to one, “And to your offspring,” who is Christ” (Gal 3:16). There can be no mistake then that the blessings are to come from Christ Himself in the work of living a sinless life, being the perfect sacrifice, and satisfying the wrath of God in Him for us. The Hebrew verb “baruk” means “to bless” and can have a range of meanings from; bless, praise, greet, and adore. In the context of Genesis 12:1-3 it appears to be “bless” as in God’s giving Abram a blessing. It is no wonder then that the Israelites saw the procurement of a blessing from God as central in their thoughts. As for those who curse you be cursed, this reminds me of the fear that Balaam had of cursing Israel and ended up blessing them. Even with riches promised by Balak the king of Moab who pleaded with Balaam to “curse them for me” Balaam said that God had told him “You shall not curse the people, for they are blessed” (Num. 22:11b-12b). The fact is that those who cursed or fought against Israel had a curse on themselves because God fought for Israel…at least when they were in a state of obedience to the Law. We can see that God is the source of blessing but mankind can bless others and bless God as well and the Abrahamic blessing is perfectly fulfilled in the life, death, and resurrection of Jesus Christ. Genesis 12, Romans 4, Galatians 3, Acts 3, Hebrews 6, 7, and 11 all fit together in the sense that they clarify what this blessing to Abraham is all about…or better yet, Who it is all about. The common concepts are salvation through this Promised Seed and the atoning work at Calvary. Moses, Paul, and Luke (among others) are trying to teach us that God is faithful in His promises. The broader context of these chapters shows the interwoven theme of the entire Bible as being His-story…that is Jesus Christ. He is that scarlet thread woven throughout the Bible. Somewhat concealed in the Old but clearly revealed in the New. What many overlook is that God expected Abraham to be obedient before this blessing would come and God would expect no less from Christian’s today.5 This same type of expectation of obedience first and blessing second continued through Isaac and would be the pattern in the Old Testament. 6 Today, we are obedient to God if we repent and trust in Christ and then we will receive that blessing which leads to eternal life. I know this is not about your article. I would like to request prayer for my son’s, grandkids and family. We are going thru a lot lately. I pray for his mercy and blessings; I really need a Miracle to happen. I believe in the power of prayer in numbers, and would appreciate prayer from all of you including people who read this God sent website. God has been there for us and I can testify that his love is real. Thank you and God Bless all of you. I am praying for you Joni right now that God will bless you and cover your family with His protection, healing and mercy. May the Father grant all of you the specific miracle you need, through His Spirit, in Jesus’s wonderful Name. Doc, you are such a wonderful Christian brother and such a positive influence on me and so many others on this website and I thank God for you my friend. Thank you for always being the “Barnabas” to so many. Joni, you can count on my prayers as well and knowing Doc as I do, you want his prayers too and will pray that God also have others take note of this prayer request to join with us in praying for you and your family Joni. Thank you, I am so glad both of you are praying for us. I was God sent to this website about 7 months ago. I have been mostly a silent reader and I am always drawn to what you write and have watched you Preach on YouTube. I was also hoping that Doc would respond I can tell he is a true man of God. I want you all to know how awesome this site is and how much it helps people. God Bless all of you! Thank you so much Joni. This makes me want to pray even more fervently for you my sister in Christ. Yes, Doc will likely respond, knowing him, and thank you for your encouragement and know that we love praying for the saints of God. What a privilege to carry everything to Him in prayer. You are so kind Christel. I appreciate that. This Covenant shows God’s great mercy on all of us, who each are unworthy to receive His forgiveness.